The table displayed immediately below is likely to surprise even our most-jaded readers. It shows the astronomical increase in cash prices for well-known food commodities over the past 12 months. With inarguable exactness, it contradicts the nearly constant prattle in the mainstream press that inflation is under control, or that it is peaking and likely to come under control sometime soon. Some items on the list have doubled -- even tripled -- in price over the past year. Others have risen at mere double-digit rates. These numbers signal a potentially serious inflation shock for the American consumer down the road as wholesale food inflation feeds through to consumer prices. It should be noted too that these are the rates of increase AFTER the highly publicized corrections during the first two weeks of May. The Bureau of Labor Statistics likes to underplay the role of food and energy in the cost of living and emphasize instead the less volatile core inflation rate. "If you don't eat or drive, inflation's no problem," the New York Times once quipped in a headline. For the typical American, though, the price of food is unquestionably a major issue, as well as a real-life indicator for prices across the spectrum of goods and services. In fact, for most, if food prices are rising that is the very definition of inflation and, as our table illustrates, food prices have risen with a vengeance. William Dudley, president of the New York Federal Reserve, rationalized at a townhall meeting in Queens recently that "you can buy an iPad2 that costs the same as an iPad1 that is twice as powerful. You have to look at the prices of all things." A voice quickly came from the back of the room: "I can't eat an iPad!" Newsweek magazine thought enough of the retort to label it "the line that launched the Great Inflation of the 2010s." Inflationary concerns go beyond that of the citizenry to those who manage vast capital pools for governments and large institutions. Last month, Mexico's central bank surprised gold market experts with the announcement of its acquisition of 93 tonnes of the metal. The central bank's Governor, Agustin Carstens, denied publicly that the purchase reflected a lack of confidence in the U.S. dollar. At the same time, it is difficult to explain the ﻿motivation as anything else. Interestingly, Carstens was quoted by Bloomberg in mid-April that rising commodity prices had "caused uncertainty about the inflation outlook in Mexico" and "complicated the bank's monetary policy." Even as Carstens spoke, Mexico was in the process of mitigating those concerns with an unprecedented gold purchase -- the third largest over the past decade. ﻿Similarly, the University of Texas stunned the market with its announcement of a $1 billion physical gold purchase. Kyle Bass, the hedge fund manager and board member who recommended the UT purchase, said, "Central banks are printing more money than they ever have, so what's the value of money in terms of purchases of goods and services. I look at gold as just another currency that they can't print any more of." Since 2001, gold's bull market has been driven principally by systemic risks, not by inflation -- a circumstance that should give us all pause. Add rampant inflation to the mix, and you have the impetus for even stronger demand in the months and years to come. Mexico and the University of Texas are not alone in hoping to shore up their balance sheets with gold. The list in fact grows longer by the day. Robin Griffiths is the highly-regarded City of London chartist who plies his trade at Cazenove, reportedly stock broker to the Queen. Citing "loose monetary policy," "money printing" and Fed chairman Ben Bernanke's "trashing of the dollar" he believes gold's bull market could go into hyperdrive. "I think it will all be over by 2015," he says, "a lot of it depends on how aggressively paper monies get printed from here on in. I think $3,000 is an absolute minimum target. I can believe in targets certainly above $5,000 and it's theoretically possible to go to $12,000. . ."
Those targets should be taken with a grain of salt as should the 2015 timeline, but it gives you an idea what some contemplate for the gold price in the face of an accelerated inflationary, or even hyperinflationary, assault on the dollar's value. Ultimately, what the parabolic increase in cash food commodities over the past year is telling us is that gold's best days may still lie ahead. The Wikileaks/Financial Times revelations on significant gold buying interest in the Middle East — notably Iran's central bank, Jordan's central bank and Qatar's sovereign wealth fund — brought to mind the story of Saudi Arabia's King Ibn Saud and his sale of oil concessions to the major oil companies. In payment he received 35,000 British Sovereigns — a coin many of you hold in your own sovereign wealth funds. The good king understood the difference between the value of gold and the value of a paper promise. At the time (1933), the British Sovereign's value stood at $8.24 each, or $288,365 for the lot. The price of oil was about 85¢ a barrel, and a British Sovereign could buy about ten barrels. Today those same Sovereigns would bring a little less than $12 million at melt value ($338.00 each) and a barrel of oil is selling for about $115. Thus, a British Sovereign can buy a little under three barrels of oil — a statistic which gives you an inkling of gold's current undervaluation. For gold to buy the same amount of oil now that it did in 1933, the price would have to go to nearly $5000 per ounce — an interesting calculation for those who think gold is overvalued and in a bubble. In the gold market where there's smoke, there's fire. If members within one class of investors — e.g., central banks, sovereign wealth funds or hedge funds — you can be assured that other members of that same group are similarly involved. Recent activity within the hedge fund industry with respect to gold is exemplary. It follows then that if Iran, Qatar and Jordan — themselves threatened by the popular Pan-Arabic uprisings — are acting on their interest in gold, can Saudi Arabia, the United Arab Emirates and Kuwait be far behind? If so, they will join several nation-states and a bevy of hedge and sovereign wealth funds in the pursuit. The problem they will encounter is an old one. There simply is not enough physical gold available at any given point in time to satisfy the needs of any one of these major players, let alone all of them. All of this, of course, will resolve itself in the price for which the metal sells. I note with interest that Barclays Bank — one of the five members of the London Gold Fix and an institution well-situated to experience first-hand the interest in physical metal — has predicted a top price for 2011 of $1620 per ounce. Predictions by other Fix members are equally bullish. Scotia-Mocatta predicts a high range of $1500 to $1600 with a possibility of a spike higher. Deutsche Bank is predicting $1511 per ounce for 2011 and $2000 per ounce for 2012. Both Societe General and HSBC, the two remaining members, are calling for a top-end price of $1550 per ounce. These bullion banks are in a better position than most to ascertain the sources of physical demand, and they know better than anyone the extent of global interest among key players. By the way Goldman Sachs, though not a member of the Fix, is still widely monitored for its opinion on gold. It has set a price objective of $1690 per ounce for 2011. THE RECENT SHARP GOLD AND SILVER PRICE CORRECTIONS of early May caused a wave of purchases in India. In fact bullion dealers reported some of the best volumes this year. India accounts for roughly 20% of annual gold demand. Financial Times reported that "in Mumbai's bustling Zaveri market, the gold hub of India's wealthiest city, traders were suffering from no such jitters. Indeed, they were fiercely elbowing one another to grab as many shiny bars as possible last Friday amid expectations that falling prices would cause demand to soar." At USAGOLD, we talk about what we call the "India indicator." When there is profusion of callers with an Indian accent, we start looking for the market to put in a bottom. BLOOMBERG REPORTS THAT "SALES OF GOLD COINS are on track for the best month in a year amid the worst commodities rout since 2008, a sign that bullion's longest bull market in nine decades has further to run, if history is a guide. The U.S. Mint sold 85,000 ounces of American Eagle coins since May 1 as the Standard & Poor's GSCI Index of 24 raw materials fell 9.9 percent. 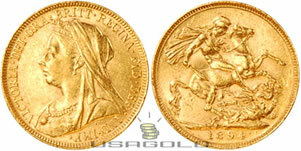 The last time sales reached that level, bullion rose 21 percent in the next year. Gold will advance 17 percent to a record $1,750 an ounce by Dec. 31 and keep gaining in 2012, the median estimate in a Bloomberg survey of 31 analysts, traders and investors shows." AS WE GO TO PRESS, THE TREASURY DEPARTMENT REPORTS that the United States will exceed its $14.294 trillion debt limit by Monday, May 16, 2011. Default, if Congress fails to increase that ceiling, will occur in early August. 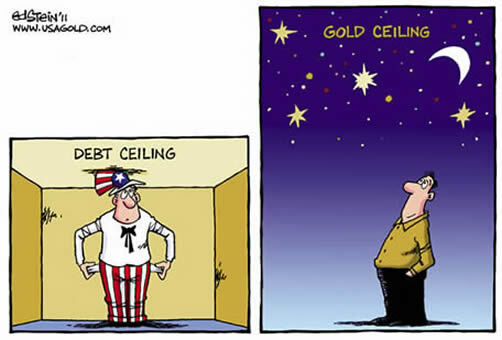 57% of Americans are opposed to raising the debt ceiling, according to the Gallup Poll. Fed chairman Ben Bernanke warns of grave consequences over the government's ability to borrow, including a spike in interest rates and "severe instability in the financial markets." HINDLE CAPITAL'S BEN DAVIES, an analyst with whom we find ourselves agreeing on a regular basis, says that it's not speculation driving gold and silver prices higher, but monetary debasement. Blaming speculators for rising commodity prices is like blaming the weatherman for the weather. THE USAGOLD WEBSITE CONTINUES TO GROW by leaps and bounds. We recently were forced to go to a dedicated server to keep up with the traffic. Our mobile pages are leading the way. Smart phone users like the user-friendly live price page, and also frequent the news link offered there regularly. WE HAVE ADDED A VIDEO VERSION of our Daily Market Report linked through our mobile page. Hosted by Jonathan Kosares, it provides an easy way for you to keep up with the issues and events driving the gold market on your smart phone. JULIAN PHILLIPS (GOLD FORCASTER): "The Chinese mining sector is currently producing 340 tonnes of gold a year and rising. No doubt there is every encouragement from the State for this figure to rise. We believe that no matter how high it rises, little if any of that supply will reach the world's 'open' market in London. Even global gold production is not likely to rise significantly from the current level of around 2,500 tonnes. Therein lies a development that, in itself, will change global gold market dynamics." TOCQUEVILLE GOLD FUND'S JOHN HATHAWAY on the recent corrections in gold and silver: "It's not a trend change. Just take a couple of weeks off and come back to it. The investment thesis is not at all in question here. It's just the dynamics of the market." THE WALL STREET JOURNAL'S DAVED COTTLE ASKS WHY Greece and Portugal, which own 112 tonnes and 383 tonnes of gold respectively, shouldn't be forced to liquidate their gold. Back in July, 2010, we puzzled how it was that the Bank for International Settlements would suddenly show 382 tonnes of gold on its balance sheet at precisely the same time that Portugal's debt and fiscal problems were making financial headlines. Our view then was that Portugal had pawned its gold to deal with its financial woes. The answer to Mr. Cottle's question, in at least Portugal's case, could very well be that the family jewels have already been pawned. 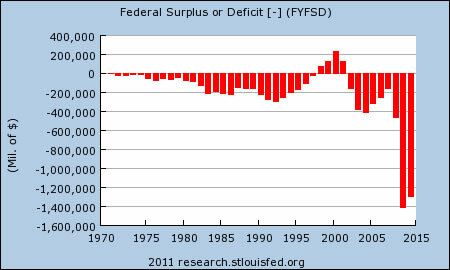 IN CASE ANYONE THINKS that the current borrowing spree on the part of the federal government is statistically insignificant, we offer the following chart from the St. Louis Federal Reserve. . . And you thought the credit crisis peaked sometime in 2009. "I think the biggest take-away we can grab from [Mexico] is that another region of the world, another central bank region is buying gold. So, it is not just concentrated in Asia, that it is now in the Americas. So, the potential for another central bank in South America perhaps could be quite high going forward." "Finally, with gold supported by multiple fundamental forces, one of our pre-conditions for a bubble is the asset has to be 'over-owned.' All the gold produced around the world over the past 110 years (which accounts for more than 80% of all gold ever mined) at today's prices is equivalent to only about 3.9% of the combined total value of stocks, bonds and cash around the world. While up from the 1.3% in 2000 when gold prices were depressed, it is similar to the 3.5% in 1990 and well below the whopping 12.1% in 1980 when gold traded near its last peak. While gold's popularity is returning, it does not seem 'over-owned.'" "The official wisdom is that Greece, Ireland and Portugal have been hit by a liquidity crisis, so they needed a momentary infusion of capital, after which everything would return to normal. But this official version is a lie, one that takes the ordinary people of Europe for idiots. They deserve better from politics and their leaders. To understand the real nature and purpose of the bailouts, we first have to understand who really benefits from them. Let's follow the money. Already under this scheme, Greece, Ireland and Portugal are ruined. They will never be able to save and grow fast enough to pay back the debts with which Brussels has saddled them in the name of saving them." "I've been recommending gold since I started Mad Money . . .There will be moments of fluff but I'm not really trading it . . . I regard it as the currency of your portfolio . . . I feel very strongly we are not in a topping phase. . .I'd rather have the insurance policy of gold rather than the insurance policy of GEICO." 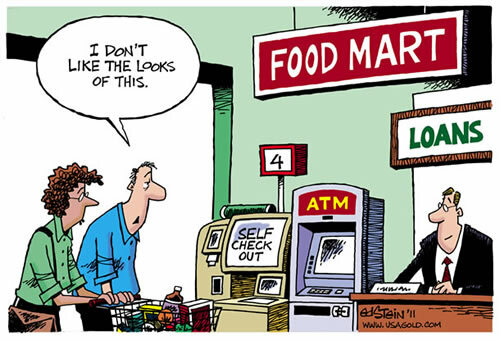 "The bigger inflation event (QE3?) would use newly created base money for the immediate benefit of debtors. Sending checks to indebted homeowners made out to their creditors would be an example of quantitative easing that would be popular among the masses and economically stimulative. It would allow a new credit bubble to expand and prices of goods, services and assets to increase. We think this form of QE — broad debt socialization – is inevitable." "All the while we expect precious metals, agricultural, basic materials and energy prices to climb consistently through QE2 and QE3. We believe the bull market in precious metals will run faster and higher than consumable commodities and begin to fade only after a third-wave parabolic price shift higher. We think the bull market in consumable commodities will kick-in significantly once consumer confidence and significant (price-generated) nominal output growth returns." Funny, but even Cramer's bad calls can't stop Congress from spending. 21 May 11, 16:56 gold bubble???? Gold is officially in a bubble?? Who's been taking acid? All the time real interest rates are negative, gold is NEVER in a bubble. "FIRE Economy": Finance, Insurance and Real Estate depending on debt and interest payments - NOT producing a good or service.